Digital Technologies Give Dying Languages New Life : All Tech Considered As many as half of the world's languages are at risk of disappearing by the end of the century. More aboriginal groups around the world, including Oregon's Siletz tribe, are using "talking dictionaries" and other digital tools to help preserve their native languages. In an undated photo, members of the Siletz tribe gather for the Siletz Feather Dance in Newport, Ore. The tribe is using digital tools to help preserve its native language. There are some 7,000 spoken languages in the world, and linguists project that as many as half may disappear by the end of the century. That works out to one language going extinct about every two weeks. Now, digital technology is coming to the rescue of some of those ancient tongues. 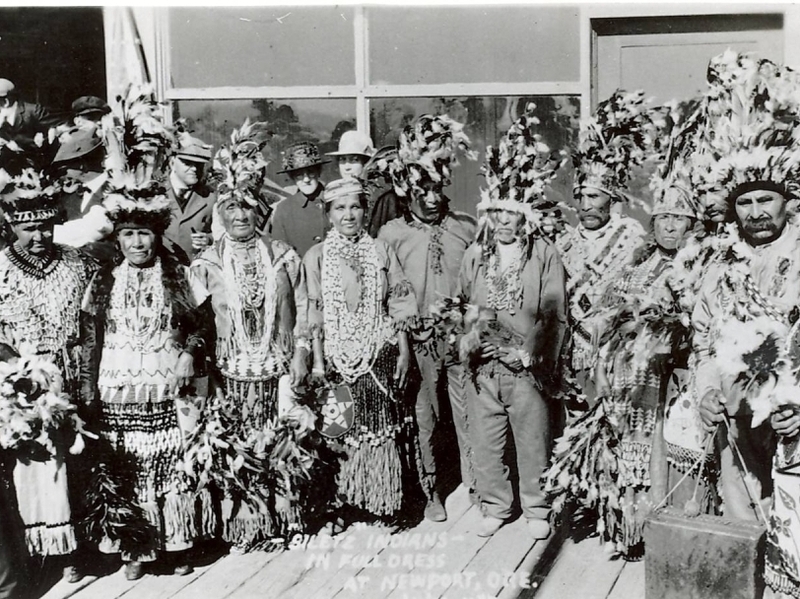 Members of the Native American Siletz tribe in Oregon say their native language, also called "Siletz," "is as old as time itself." But today, you can count the number of fluent speakers on one hand. Siletz Tribal Council Vice Chairman Bud Lane is one of them. "We had linguists that had come in and done assessments of our people and our language and they labeled it — I'll never forget this term — 'moribund,' meaning it was headed to the ash heap of history," Lane says. The tribal council was determined not to let that happen, so Lane brought in help from outside. He worked with a group of National Geographic Fellows to record 14,000 words and phrases in his native tongue. The word translations are now available online, along with lesson plans, as part of a so-called talking dictionary hosted by Swarthmore College in Pennsylvania. Swarthmore linguistics professor David Harrison has also posted talking dictionaries for several other highly endangered languages from around the world at the site. "This is what I like to call the flip side of globalization, or the positive value of globalization," Harrison says. "We hear a lot about how globalization exerts negative pressures on small cultures to assimilate." But he says language activists now have modern digital tools with which to go on the offensive, including iPhone apps, YouTube videos and Facebook pages. Harrison and a colleague in Oregon have also mapped hot spots for endangered aboriginal languages. One such region is the Pacific Northwest. Tribal languages in Oklahoma and the American Southwest are also judged to be at risk of extinction. In Canada's far north, the Inuit people are struggling to preserve Inuktitut, their native language. Part of their strategy was to work with Microsoft to translate the ubiquitous Windows operating system and Office software into Inuktitut. "So many people will spend their entire day sitting in front of a computer, and if you're sitting in front of your computer in English all day then that just reinforces English," says Gavin Nesbitt, who led the project. "If you're now using Inuktitut, it's just reinforcing that this is your language." Microsoft has also worked with language activists in New Zealand, Spain and Wales to translate its software into Maori, Basque, Catalan and Welsh, respectively. Back in Oregon, Siletz speaker Bud Lane cautions that technology alone cannot save endangered languages. "Nothing takes the place of speakers speaking to other speakers and to people that are learning," he says. "But this bridges a gap that was just sorely needed in our community and in our tribe." Lane says he has seen signs that the tide is turning — tribal youth are now texting each other in Siletz.